I must say that eating surprising combinations of vegetables often translates to my ultimate dining experience. I never cease to be amazed at how different cooks make and present vegetables – steamed, sauteed, roasted, broiled…and oven blasted. Now I know many of you have likely cooked green beans, and perhaps some of you have cooked them in the oven on high heat with a simple olive oil, salt and pepper preparation. But add radishes to kick this up a notch, then finish the dish with tender herbs fresh from your garden and you will experience a taste sensation. For some reason I cannot explain, my children all love radishes. Radishes are easy to grow in the garden and if you continue planting radish seeds at intervals, you’ll have these all summer long. Every week at the farmers market I purchase a bunch or two of radishes. These are most often eaten raw, dipped in salt and butter, or atop one of my world famous salads. 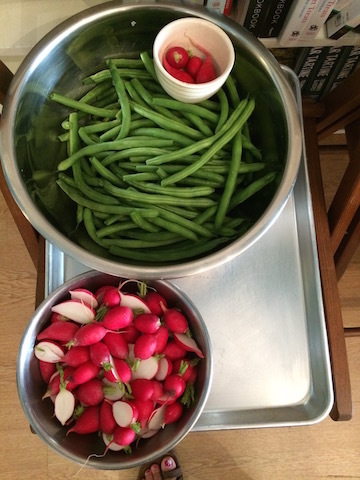 But this week I decided to cook radishes with the green beans. Another bonus with these colorful gems – it is hard to overcook radishes! This is pretty simple. And if you are as blown away as I seem to be with the taste here you’ll find yourself making this again and again before summer’s end. 1 pound fresh green beans, wash and trim the ends but leave them whole. Dry well. Preheat convection oven to 450 degrees. If you don’t have a convection setting, preheat to 500. Take out a jelly roll pan. 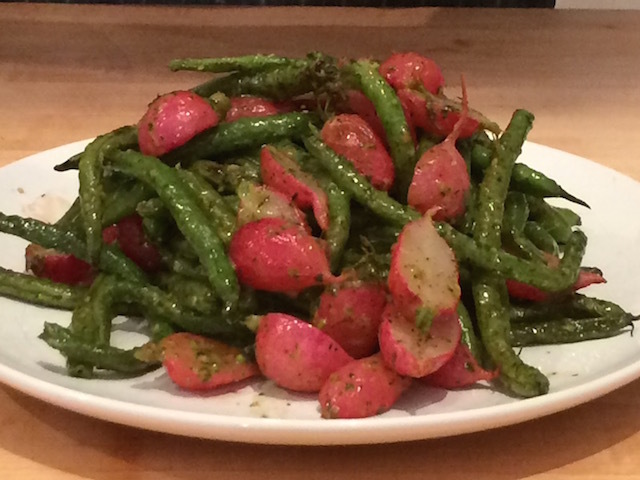 In a large bowl, toss the dry green beans and radishes with canola oil and salt. Mix in the radishes and dump everything onto the cookie sheet, making sure there is just a single layer and that most of the beans don’t overlap each other or you will end up with steamed green beans. Bake for 10-15 minutes or until the green beans have a bronze color in parts – much like caramelizing. Place into a serving bowl, add everything listed under “finishing”. Eat and enjoy, and don’t be surprised that your kids will love this! This entry was posted in Vegetables and tagged Green Beans, Oven Blast, Radishes. Bookmark the permalink.